Raja Krishnamoorthi, candidate for the open seat in the Illinois 8th congressional district, visited the Addison Aaron’s on Tuesday, September 13, 2016. He was hosted by IRDA President, Casey Pristou, and Greg Ponte, President of ARMCO, LLC, the store’s owner. The event was part of APRO’s 2016 In-Store Legislative Conference congressional grass roots campaign. Greg gave candidate Krishnamoorthi a tour of the store and discussed with him how the flexibility and versatility of the rent-to-own transaction meets the needs of his customers. Krishnamoorthi was able to see first-hand how the RTO business works and learn about the economic impact the RTO industry has on his district and the entire state. Illinois is home to more than 220 rent-to-own stores, serves more than 120,000 customers each month and employs more than 1,300 statewide. 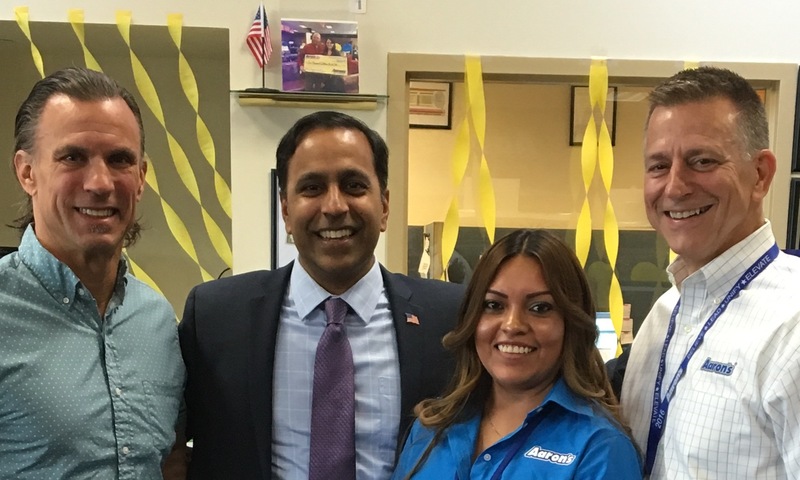 “It was great having candidate Krishnamoorthi visit our store and spend time with our employees and customers. It is obvious that Raja is working hard to know his district and it shows. We appreciate Raja taking time out from his busy campaign schedule to meet with us.” related Greg Ponte. About IRDA – The Illinois Rental Dealers Association (IRDA) works closely with the Association of Progressive Rental Organizations (APRO) to provide membership and the general public with the latest information regarding legislative initiatives concerning the rent-to-own industry. The IRDA works to ensure a vital future for its industry through networking, education, political outreach and legislative vigilance.